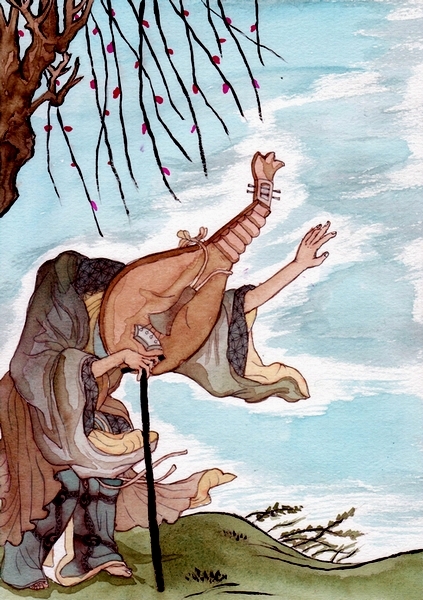 Description: An animated biwa, which is some kind of Japanese short-necked fretted lute, used in storytelling. Once they come to life, they will only allow themselves to be played by special people. Frequency: Low, unless your are a Japanese musician storyteller. Danger Level: Physical—low; Spiritual—will play your ear off. Seriously folks. People have lost ears. Mab’s Eye View: Frankly, these pose no danger to the average joe, except that you might feel like an idiot if you run your fingers over the strings and no sound of any kind comes out. But then again, considering that they walk around on legs, why would you do that? Though, come to think of it, where do they get those legs? Maybe the ‘special guy’ who can play it gets his head sucked into the body of the instrument and, from that day forth, has the head of biwa. Seriously, Folks, you don’t want to mess with that. Even your ugly head is better than a biwa-head. Also, a good player can use a biwabokuboku to ensorcel the unwary. Humans are so easy to enchant with magical music! Stay away from biwabokuboku…and for safe measure, I wouldn’t listen to music at all, if I were you. December 12, 2013 in Mab's Handy Guide to Surviving the Supernatural.